Verification and validation (V&V) is an important process in the automotive industry, from experimental research-stage in powertrain development or vehicle components, through all phases of product development and finally to quality assurance in production. Units under test (UUT) need to be densely instrumented during testing to measure properties and characteristics, such as torque and performance, fuel consumption, emissions, process or driving behaviour. This is typically done using a large numbers of sensors. Most of this data needs to be acquired cyclically, with stringed time determinism while satisfying strict dependability requirements. Other signals might be rather event-based, may appear non-deterministic and even in bursts, with a need for precise time-stamped acquisition. 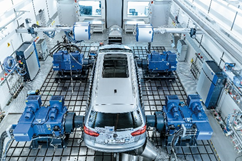 Going wireless for instrumentation of UUT’s will provide a significant gain in flexibility and productivity in automotive testing and production. Wireless connectivity for sensor (and actuator) systems allows faster and more efficient setups, as there are no more limits in placement and number of sensors. Testing productivity rises, and a number of potential failures (wrong wire type, mis-wiring, corroded connectors etc.) are solved by the very nature of wireless connections. Trust is essential, as it also has to integrate into large-scale manufacturing systems. Multi-technology wireless solutions including PAN based on 802.15.1 and .4 in multiple frequency bands, shall be combined with 4G/5G cellular as backbones or bubble-to-bubble links, will allow balancing performance, range, dependability, energy need and costs. It is foreseeable that these general concepts might also translate in other industrial scenarios quite well, e.g., for providing flexible means of instrumentation in variable production processes. Robust and secure solutions for authentication, authorization and accounting of distributed wireless sensor and actuator systems in vehicles, in test beds and in automotive production lines considering industrial requirements and lifetime.